Portland may be known for its characteristically wet Pacific Northwest weather, but it’s a lot more than that. It’s a city that is surrounded by stunning nature, has an impressive restaurant scene, and is known for locals marching to the beat of their own drum. There is really no other city like it. Three days is the perfect amount of time to spend getting to know the city and it’s surroundings. It’s recommended that you spend the first two days in the city and then on the final day take a trip to somewhere nearby like Multnomah Falls. Here’s what to do if you have 3 days in Portland. The beauty of Portland is that it has an excellent transportation system, including a light rail called the MAX. Take the MAX directly from Portland International, straight into the heart of downtown. It’s quite easy to get around the city without renting a car. Bikes are also a popular method of getting around if you want to blend in with the locals. To get your bearings, the city is divided up by the Willamette River, into West and East generally, and then further by West/East Burnside Street, which cuts the city into North and South on both sides. You will probably spend most of your time on the west side, since this is where the center of town is. Living Room Theaters-located downtown, this theater is part cinema, part restaurant. Forget the standard popcorn and candy, here you can have a full-on meal and/or drinks brought to your movie seat. Sweet potato fries and a local beer never tasted so good. Pre-buy the tickets online to avoid being stuck in the front row. The Kennedy School-one of the things that I love about Portland is how it has a knack for transforming old spaces into something new. This former elementary school in the northeast district was turned into a bar/restaurant/hotel/movie theater and is the perfect place to spend a rainy afternoon. It feels like being back in elementary school, except the detention room is a bar. Oregon Museum of Science and Industry (OMSI)-one of the ultimate rainy day options is this fascinating museum located in Portland’s south waterfront, where you can easily spend the better part of a day. The museum features exhibits on technology, the natural sciences, and industry, a state-of-the-art theater and planetarium. Broadway Books-located in the NE Broadway neighborhood, this independent bookstore has a very friendly and knowledgeable staff. It may not have the scope of Powell’s, but it’s definitely quality over quantity and supports local authors. Make sure to check out the Broadway Books events calendar to see which authors are dropping by. Start your day out with a strong cup of coffee from Stumptown located in the Ace Hotel, and a donut from Blue Star a couple of blocks away. Afterward, head to the city’s center and start out at Pioneer Courthouse Square, a public space that is know to hold concerts, cultural events and farmers’ markets just to name a few. Make sure to also check out the Pioneer Courthouse across the street, the oldest federal building within the Pacific Northwest. For lunch stop by the biggest cluster of food pods in the city, where you can choose from a seemly endless selection of choices like #1 Bento (Korean BBQ), Nong’s Khao Man Gai (Thai-style chicken) and Shawarma Express (kebabs). There’s no seating, but you can walk a few blocks to Discover Park, where there are plenty of tables and a lively atmosphere. It’s hard not to fall in love with a city where one of its main sights is a block-long bookstore located in downtown. It’s easy to spending hours lost in its many color-coded rooms and browse the collection of around a million new and used books. Check out their Rare Book Room, which houses autographed and hard-to-find books. Make sure to also check out the Powell’s monthly event calendar for readings and discussions by a wide range of authors. Free tours are given on Sundays at 10 a.m. and 4 p.m. and take around 45 minutes. Head to this area for some seriously good Italian food at Piazza Italia. Amid a homey atmosphere with an impressive collection of soccer jerseys hanging from the ceiling and delicious pasta and pizza options, you will not regret your guaranteed carb coma afterward. It’s a small space, so make a reservation to guarantee a table. To continue the Italian food theme, get dessert at nearby Via Delizia in the form of gelato or one of their decadent baked treats. 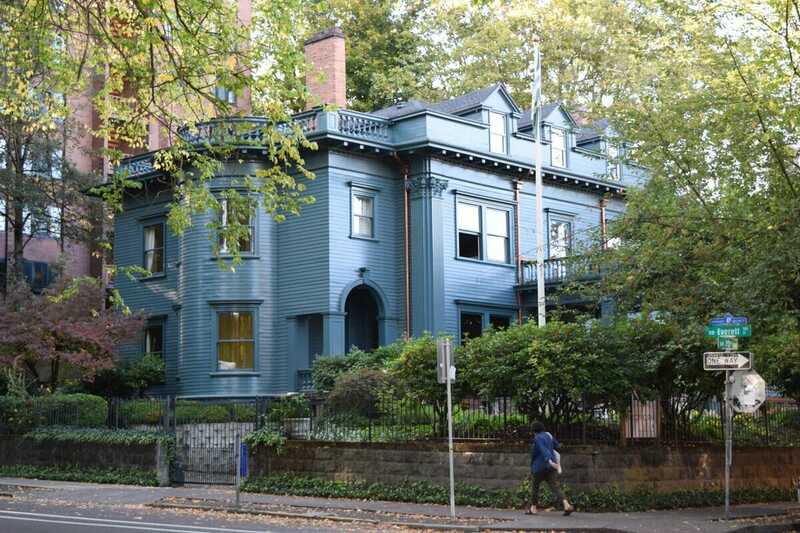 This neighborhood is located right outside of downtown Portland, but feels like a different world. Start your day off with coffee and croissants at Ken’s Artisan Bakery. Wander around this area that features historic homes (especially in the Alphabet District roughly between NW 17th and 24th). The main shopping street on NW 23rd is filled with boutique stores and some of the city’s best ice cream at Salt & Straw. Heading back to West Burnside Street and stop at Elephant Delicatessen, to pick up picnic provisions for nearby Washington Park. The main draw of Washington Park is the impressive rose garden, which is in bloom roughly from April through October. The nearby Washington Park Amphitheater as a great place to eat your packed lunch, as well as the picnic tables by the gift shop. The admission to the rose garden is free. Other notable sights in Washington Park include the Oregon Zoo, Portland Japanese Garden, Hoyt Arboretum, and the Oregon Holocaust Memorial. The park also has over 15 miles of trails, including those connected to the 40-Mile Loop that makes its way through over 30 of the city’s parks. An excellent spot for both good food and drink in a two-story industrial space in NW Slabtown. There is a full-service restaurant and a wide selection of Breakside craft beers. Try a sampler tray if you want to sample different brews. If beers is not your thing, they also have wine and cocktails. About 45-minutes outside of Portland, the largest waterfall in Oregon is located in the Columbia River Gorge. To see the Benson Bridge and Multnomah Falls it’s an easy 5 minute walk from the parking lot. If you want to hike to the bridge, there’s a switchback trail that leads to the bridge, but can be closed depending on weather and/or fire danger. The parking lot can get filled up quickly, so get there early. There are also buses like the Columbia Gorge Express that can take you to the Multnomah Falls without the stress of driving. Staying in or nearby downtown Portland is ideal, since you can easily walk or take the light rail to most of the major sights, without having to deal with the hassle of a rental car. Reasonably priced and spacious suites located right outside of the downtown area. The hotel is in the scenic residential neighborhood of Goose Hollow, that is walking distance to the hip Northwest District, and Washington Park (International Rose Test Garden). If you want to be in the middle of all the action, this hotel is located right in center of downtown and is an easy walk to sights like Powell’s Books, Pioneer Square, and Portland Art Museum. The property includes a restaurant/bar, valet parking, and a snack bar/deli. For true luxury lodgings, this classic boutique hotel should be at the top of your list. The hotel is located right in the heart of downtown, and is a great home base for those who want to be walking distance to major sights. Highlights on property include highly-acclaimed restaurant Jake’s Grille and bar Jackknife. What would you do with 3 days in Portland?